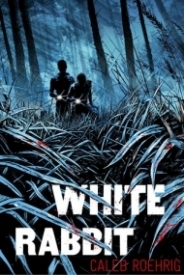 Caleb Roehrig, author of Last Seen Leaving, delivers another spellbinding YA murder mystery in White Rabbit. Rufus Holt is having the worst night of his life. It begins with the reappearance of his ex-boyfriend, Sebastian—the guy who stomped his heart out like a spent cigarette. Just as Rufus is getting ready to move on, Sebastian turns up out of the blue, saying they need to "talk." Things couldn’t get worse, right? Then Rufus gets a call from his sister April, begging for help. He and Sebastian find her, drenched in blood and holding a knife beside the dead body of her boyfriend, Fox Whitney. April swears she didn’t kill Fox. Rufus knows her too well to believe she’s telling him the whole truth, but April has something he needs. Her price is his help. Now, with no one to trust but the boy he wants to hate yet can’t stop loving, Rufus has one night to clear his sister’s name . . . or die trying. Rufus just wants one day of semi-fun, something he hasn’t had since his ex-boyfriend, Sebastian, wrecked his heart. But then, Rufus gets a call from his sister, April, saying she needs help, right at the time Sebastian finds him and asks to talk. Sebastian and Rufus rush to find April, but when they do, they get a shock: April is covered in blood with a knife in her hand and the body of her boyfriend, Fox, dead beside her. April promises them she didn’t do it and doesn’t know what happened. They strike a bargain to clear her name, and suddenly, Rufus is back in the company of his ex with a murder to solve…and all he wanted was a nice party on the Fourth of July. WHITE RABBIT is already one of my top 2018 reads. The pace enters a break neck speed from the first page and doesn’t stop until the end. The whole story takes place in only a number of hours or a couple of days, and each second is used masterfully. The mystery plot has a fantastic build, and though I eventually suspected the right person, there were still plenty of twists and turns that left me gasping in surprise. As well done as the mystery is, the personal relationships might even top that as my favorite part of the novel. Rufus and Sebastian’s relationship is filled with great romantic tension, and Rufus is immediately relatable in the beginning of the novel as a character who is struggling to get over a break up and just wants some peace and quiet. I also love the dynamic between Rufus and his family. He and his mom are close, which partially motivates him to help April out, as she offers much needed money for him in exchange. Moreover, April is a strong secondary character, equally frustrating and surprisingly kind at different moments. Caleb Roehrig’s latest continues to support his status as a must-read author. WHITE RABBIT is a thrilling mystery with breathless pacing, swoony romance, and an incredible adventure.